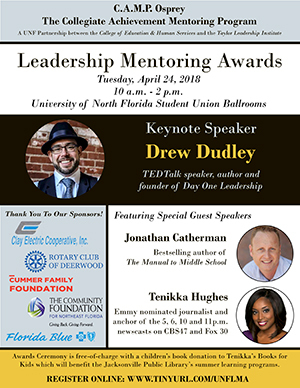 Keynote Speaker Drew Dudley, TEDTalk speaker, author and founder of Day One Leadership. Featuring Special Guest Speakers: Jonathan Catherman, Bestselling author of The Manual to Middle School. Tenikka Hughes, Emmy nominated journalist and anchor of the 5, 6, 10 and 11p.m. newscasts on CBS47 and Fox 30. JACKSONVILLE, Fla. - It was the perfect solution to a hurricane-sized problem. Tuesday, the University of North Florida women’s soccer team hosted students from Middleton Burney Elementary in Putnam County as part of C.A.M.P. (Collegiate Achievement Mentoring Program) Osprey. “We really wanted to build an experience for them to get them believing in themselves and believing in their school again -- and really having some fun and getting their minds off of all they've gone through during Irma,” said Dr. Matthew Ohlson, director of C.A.M.P. Osprey. A group of students at Palataka's Mellon Elementary School are spending the first semester of preparing to be "really good as big kids" through a new virtual mentoring program. The University of North Florida is partnering with Mellon this year to offer C.A.M.P. Osrepy, a collegiate achievement mentioning program based out of the college's Jacksonville campus and conducted at Mellon via video call each week. According to Jennifer Rivera, Northeast Florida Education Consortion supervisor of curriculum and instruction, UNF profess Matthew Ohlson contacted the consortium hoping to connect with a school south of Duval County. The Mawi Leadership course is a comprehensive curriculum based on the leadership lessons & activities developed by the internationally renowned, Mawi learning. C.A.M.P. (Collegiate Achievement Mentoring Program) Gator Is a leadership development course offered by the College of Education at the University of Florida and taught by FLVS’s own, Dr. Matthew Ohlson. The program will also be hosting two on-site campus visits which will allow mentors and mentees to learn about the resources and activities on the collegiate campus. We hope that this pilot program will lead to increased partnerships between FLVS students and institutions of higher education throughout the state including mentoring, leadership development, STEM, and experiential activities. 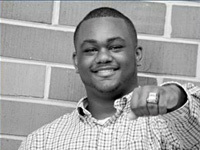 Delvin Rahynes became a participant of C.A.M.P. 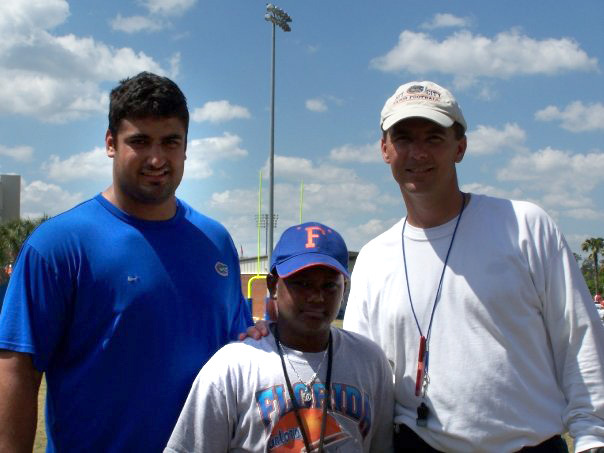 Gator in the 6th grade at PK Yonge Developmental Research School at the University of Florida. What an experience it was for him! He experienced both a learning disability and other issues that could sometimes make school and friends a challenge. C.A.M.P. Gator gave him a rock-solid foundation that consisted of both leadership and self esteem skills. In just a few weeks graduate from high school! The skills he learned has prepared him to take on the roles of student manager of the girls basketball and volleyball teams. He volunteered more than 800 hours in the local VA medical center. One of his biggest highlights was being interviewed by ESPNU about C.A.M.P. Gator. He also had the opportunity to be mentored by Javier Estopinan. During his activities with C.A.M.P. Gator he met the legenday Cam Newton and Tim Tebow. In August, of this year, he continues his endeavors, as a college student athlete himself. He will be joining the Track Team at Kentucky Wesleyan College in Owensboro, KY where John Blackwell is the head coach. C.A.M.P. 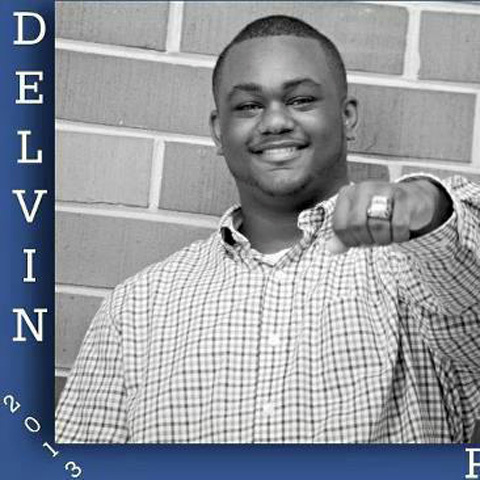 Gator, UF athletics and great leadership/interpersonal communication skills have all combined to college a promising choice for Delvin. University of Florida UF students and P.K. Yonge students shot hoops, tossed footballs and raced Friday in an Olympics-style event that is part of the C.A.M.P. Gator program.